The contents in your PFD, paddle west, is something that can make or break a sticky situation on the water. Whether you are a leader or a participant on the water, you should consider your contents and have a purpose with it. If you have the right tools in your PFD it is possible to fix or temporarily fix a lot of issues with sea kayaks and people. This means you are not dependent on digging out stuff from your kayak nor landing your kayak to fix stuff. Both can be tricky or impossible given rough enough conditions. Below is what I choose to have in my PFD. I am using the Palm Kaikoura PFD, as it has plenty of space for all the things I want to bring. A piece of string to tie stuff together. Has a large number of applications. Nut tool for getting stuck skegs out. Hand held flare, for signalling. Cling wrap. First aid: Open wounds, sling. Boat repair: Lost hatch, small cracks in kayak. Sun factor stick, prevents sun burn. Spare carabiner. In case loss of primary carabiner used for towing and coupling sea kayaks. Ferro rod. Used in combination with knife to create sparks to ignite fire. With this in your west you can possibly create a fire within a minute of exiting your kayak. Seal ferro rod with tape to prevent salt water degradation. Wet notes. A waterproof notebook. Electrical tape, for cuts on fingers and hands. Compression bandage. For cuts on head and hands. Mouth to mouth protector. For own safety when performing mouth to mouth. Means of communication. 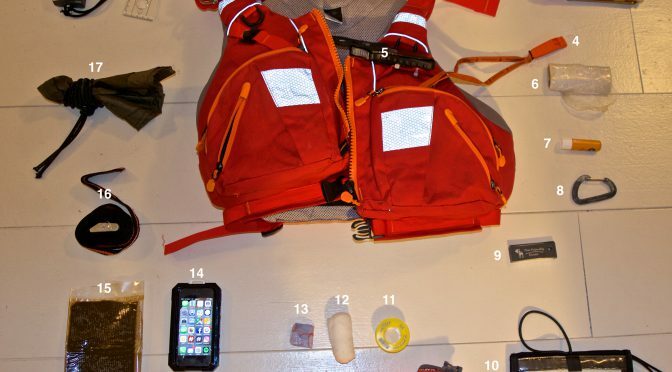 Either a VHF radio or a mobile phone in waterproof case. Denso tape. Used by plumbers to repair leaking pipes. Works in wet environment. Allows temporary, on the water, fix of leaking kayak (sold here). Strap. To fix skeg stuck in the out position. Simply tighten strap around kayak and skeg to force stuck skeg in. A piece of waterproof tarp and bungie cord. To fix lost hatch. Watch with stopwatch. To tell time and to keep track of distance travelled when night navigating. Light. A shoulder mounted light to signal other boats and kayakers. 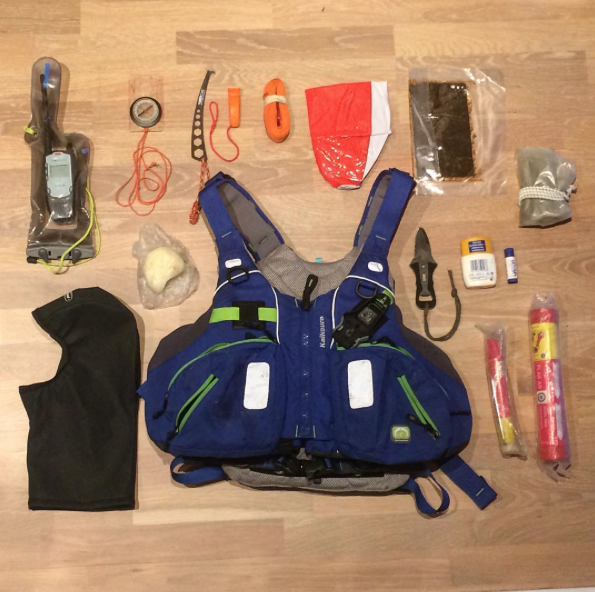 I always find it useful to learn from other sea kayakers, so heres what sea kayak coach and guide Matt Skuse has in his PFD. Flares, whistle and VHF for communications. Plastic sheet, shock cord and a beach ball for replacing lost hatch cover. Denzo tape and wax to patch holes. Nut key for clearing jammed skegs. Tape and crab for towing harnesses and providing tail drag. Knife, compass, lip-salve and sun cream. Aquatherm hood. 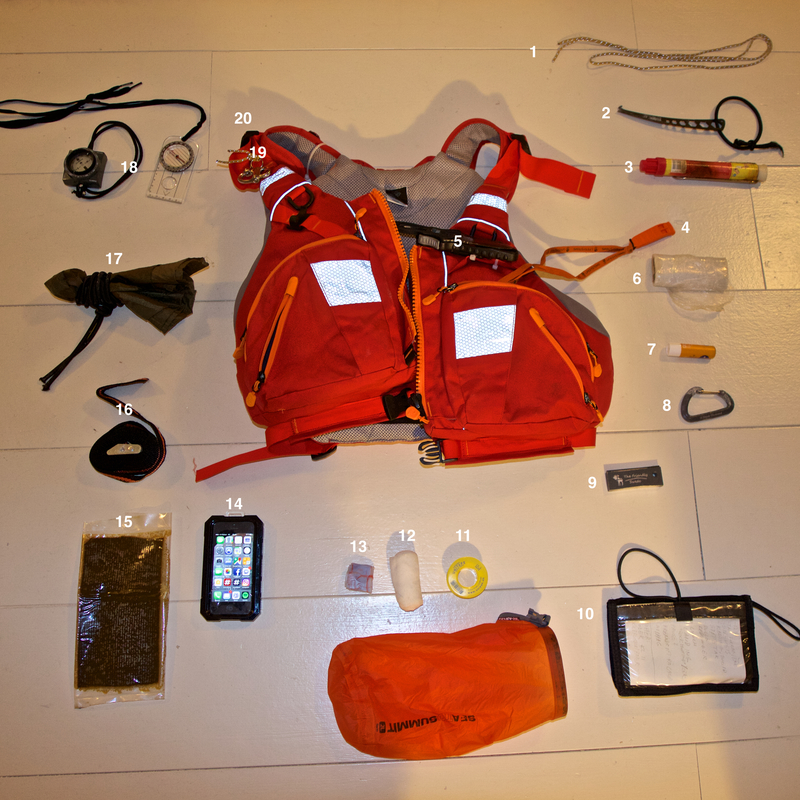 Feel free to comment and say what you think should be in a PFD for sea kayakers.